I wanted to share with you a brillant story of one woman’s dealing with a stroke. Jill Bolte Taylor is a brain scientist who had a stroke when a blood vessel exploded in her brain. She talks about what it was like and what she learned about herself and the world as a result. She was forced to look at the world not with the left side of her brain but had to look at the world from the right side of her brain. It is abit of a time commitment as the video is about 19 minutes long but well worth it. It would be wonderful if we could all view the world from the right side of our brains without the divisions that keep us all apart in our separate boxes. 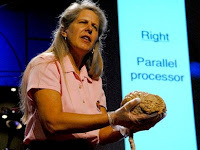 http://www.ted.com/talks/view/lang/en//id/229 TED Talks Jill Bolte Taylor got a research opportunity few brain scientists would wish for: She had a massive stroke, and watched as her brain functions — motion, speech, self-awareness — shut down one by one. An astonishing story. Explore more interesting speakers on TED Talks- many things to pique your insterest and many things out of the ordinary that you will not hear anywhere else!